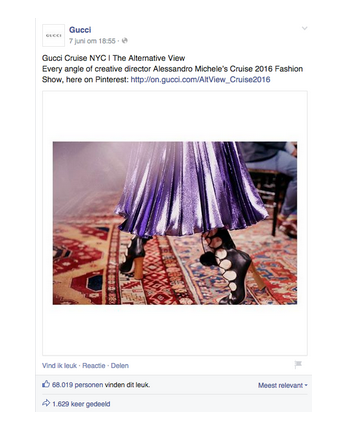 This week in our Social War research we take a look at the Pinterest account of Gucci. A relatively unknown medium with a big reach. 47% of the online consumers in the US purchased an item after an recomendation on Pinterest. An online survey shows that a single click on Pinterest has 400% more result than a Twitter click and 27% more than a Facebook click. That is why this week we will discuss the secrets of Pinterest as a social media channel. To celebrate the first Cruise Fashion show at the 4th of june in New York, Gucci collaborated with photographer Coco Captain. For Gucci she made the prettiest pictures of New York and her streets. 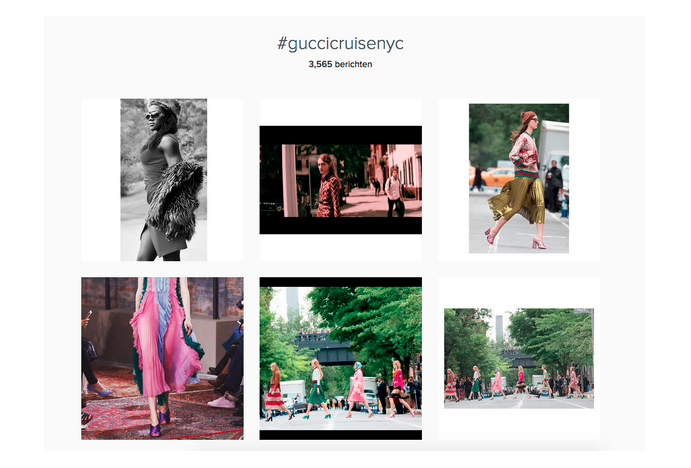 The entire campaign can be followed on Facebook as well as on Instagram via #GucciCruiseNYC. Pinterest is best compared to an enormous online pinboard where you are free to copy anyones post-its. Gain endless inspiration by searching through your neighbours and your favorite artist’s content from the other side of the globe. This is what makes it a very interesting social media channel for fashion brands. Who wouldn’t want their collection to be seen by thousands and thousands and pinned on boards all over the world? As mentioned before, 47% of American consumers are inspired by Pinterest. A single click on Pinterest is worth 400% more than a Twitter click. And 27% more than a Facebook click. However, only a few companies see the true potential of Pinterest. We present four brands that are able to use Pinterest’s full potential. Gucci also uses its Pinterest account to reach her followers. With over 41.00 followers, Gucci has already achieved quite a reach. Pinterest is the ideal way to broadcast Gucci’s latest collection. Or the celebs wearing Gucci at the red carpet. A nice collection of Gucci outfits, shining on the covers of magazines. Pinterest seems to be the ideal visual channel for the high end fashion brand. In the week of the 5th of june, we measure an engagement increase of +148% on Facebook in our Social War research. 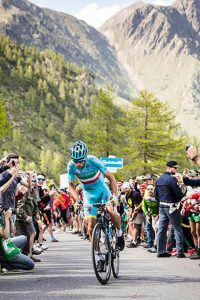 It shows that Gucci’s followers are very enthousiastic about the announcement to use Pinterest more as a social media channel. The 41.000 followers the brand already has are quite impressive. But as we take a look at the greatest parties on Pinterest, Gucci can reach so much more.